« Dilemma: Should I Propose in Front of Her Family & Friends? Check out the top 5 reasons to hire a proposal planner. Would you cook a gourmet five-course meal and serve it on a paper plate? Of course not! Hiring a proposal planner to help with your romantic proposal execution is the same concept. Your special someone deserves better than a “paper plate” idea, or chances are, you wouldn’t be popping the question. Your proposal story will be told again and again and again. You can easily make it a story your future fiancée is excited to share. According to research, 80 percent of women were disappointed with how they were proposed to by their fiancés/husbands. An experienced and creative proposal planner can take a proposal from thoughtless to thoughtful, and it’s worth every penny! We’ll prove it! It is vital to find a proposal planner with quality resources and a proven track record. A creative and experienced proposal planner can help brainstorm personalized proposal ideas so your marriage proposal is unlike any others. We cannot stress enough…personalizing your proposal is key. Our team, The Yes Girls, specialize in customized, remarkably detailed marriage proposals because that’s the only way we believe it should be done. Are you wondering how The Yes Girls can personalize a proposal if we don’t know you or your girlfriend? We ask our clients to fill out our relationship questionnaire, which gathers enough information and memories to customize your proposal ideas to your personalities and budget. Whether it’s a small intimate setting or an elaborate affair, proposals should exuberate originality and be catered to your relationship. No relationship is identical to another, so why shouldn’t your proposal be one-of-a-kind as well? Hate the thought of an argument on your proposal day? It’s more common than you think. Some may wonder, why is this? Typically, the guy is so focused on everything going smoothly and in a timely manner, that any delay or curveball thrown by his soon-to-be fiancée means high anxiety. When you have a proposal planner taking care of the proposal décor, set-up, and timeline, you aren’t worried about your plans unraveling at the seams. If your girlfriend is a little delayed, it’s no big deal; it’s definitely not worth the argument because your proposal planner and vendors can adjust. With a simple text message to your coordinator, your problems are solved. If you don’t have a sister or trust any of the females in her life to not spill the beans, a proposal planner will be your best friend. A proposal planner is separate from your circle of friends, so your secret is kept safe. With a proposal planner, you will find reassurance by confirming your proposal idea is romantic, thoughtful and “female friendly.” The Yes Girls is a team of ladies who believe that having a female’s perspective isn’t just a good idea, but a must. It’s really that simple. If you don’t have the time or the resources, such as relationships with quality and affordable photographers in your area, your proposal planner will. Although it would be nice to have an unlimited budget, creating a thoughtful proposal is not based on that, but on connecting the right vendors with the right personalized plan. A proposal planner has resources and/or does the intensive research to make sure that your proposal will be flawlessly executed; plus, you’ll get the most bang for your buck. The small, thoughtful details such as her favorite photo, flower, or painting take a proposal from good to “WOW!” Your proposal planner can also arrange a post-engagement party to celebrate with all your family and friends. You’ll be too occupied to worry about all the elements coming together, but your proposal planner is not. From our own experience, we know with an amazing group of vendors and a proposal planner contracting, negotiating with, and confirming vendors/set-up, your proposal agenda will be orchestrated effectively all behind the scenes, so you can enjoy the proposal day with your girlfriend. You just bring the ring! 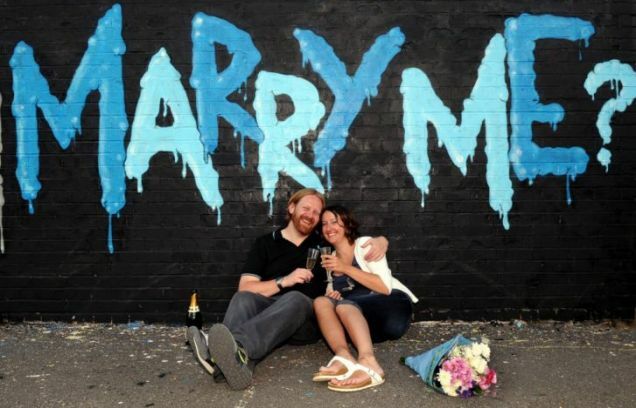 - Lack of planning leads to a poorly executed and flustered proposal. Furthermore, besides just the common mistakes, female proposal planners can tune into the smallest details from what type of outfit your gal wants to be wearing. For example, she’s too cold to get out of the car but you’re prepared and brought a jacket. The Yes Girls have simple ways to think ahead for you, and avoid even the smallest mistakes, which makes her day a dream come true. Still not convinced? Here are some thoughts from past clients. Let “The Yes Girls” package your proposal perfectly. It’s time to take the dread out of the “romance stuff” and leave the details to us! This entry was posted on Tuesday, August 9th, 2011 at 7:20 pm	and is filed under Proposals + Rings. You can follow any responses to this entry through the RSS 2.0 feed. You can leave a response, or trackback from your own site.